About to hit bed, but a few quick biased thoughts to keep us in the mood that now is when lots of the real presidential election is happening - not later in November. Democrats. No surprise, despite heavy press to the contrary. Why is the New York Times calling his result a "sharp blow" and "startling?" He got 2nd place, but it was only the difference of a few thousand people. This race is still Clinton and Obama (tonight's speech like a black-gospel sermon), with Edwards (aka hans solo) trailing a distant third. ps - did clinton get teary eyed? Republicans. Another less dramatic result than CNN would have you believe. Huckabee dropped from 1st to 3rd. But it was expected (New Hampshire isn't nearly as evangelical Christian). Will do well in SC. 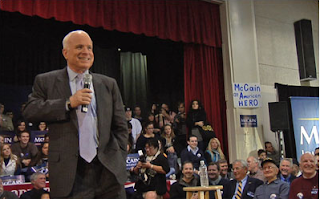 Go McCain on winning - and I don't see why not - I still find him a national candidate. Romney on the other hand, seems to be (sadly) sticking in there at 2nd (watch his campaign remove McCain campaign signs). I wish the mechanical wonder would be removed himself. Oh, and if Guiliani doesn't get a big win in Florida, he's toast. ps - the early stuff is important, but still just fireworks. Bill Clinton in 1992 got 3rd place in both Iowa and New Hampshire. He came back to win in Illinois. (Illinois friends - Vote on Feb 5th).